Beaver is known as the rolls royce of summer camps! I have 3 boys and we have tried many other camps but this is by far the best run and best quality overall. Everyone from 1st year counselors to 16 year counselors are always extremely helpful and polite! 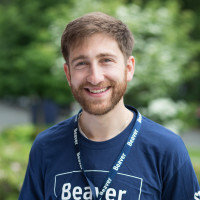 What I love best about Beaver: I believe there is no better place than summer camp when it comes to positively impacting the growth of children. At Beaver, our close-knit community, the chance to try new things alongside supportive role models, and our emphasis on participation over excellence, all provide the ideal environment for a child to develop a stronger sense of self. This is what we strive to do each summer here at Beaver. Interesting fact: I wear a different crazy hat every afternoon at pick-up during the summer. My hat collection is now so large that I can’t keep track of them all! 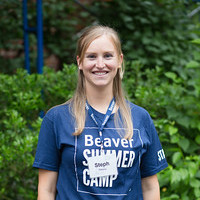 What I love best about Beaver: Camp is such a great experience for children and I love being a part of Beaver Summer Camp. The staff team that we form each summer is always such a caring and dedicated group of educators. 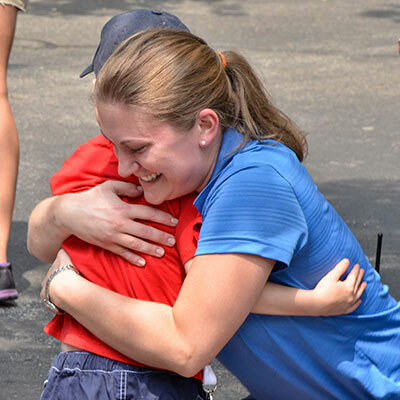 I find it rewarding to work with people who love children and enjoy making a magical experience for our campers. Interesting fact: I taught in Laie, Hawaii for one year. My classroom faced the ocean. I still write to my co-teacher 3 times a year. She is retired, but she is a great pen pal. She does not believe in email. What is the best part of working in the Camp Office? We get to interact with so many different people, who call or come by the office. It is great as we get to know campers, their families and staff, from all divisions and areas of camp! Interesting fact: My husband and I are each one of 6. Each of our oldest brothers is Bill, each of our oldest sisters is Janet. 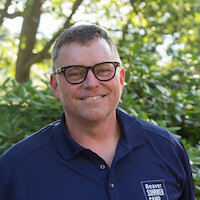 When not at Beaver: I teach 6th grade math and science for Topsfield Public Schools. What I love best about Lower Camp: The best part of Lower Camp is seeing kids experience things for the first time. There is nothing better than watching as our young campers make new friends, learn to swim, create art, sing together, and enjoy a summer experience that they’ll never forget! I love seeing the smiles on our campers’ faces as they fall asleep in their car seats at the end of another excellent, exhausting day. Interesting fact: As a child, I lived all over the United States and Canada. Moving so often gave me a deep appreciation for lasting friendships and finding a place to call home…maybe that’s why I love Beaver so much! When not at Beaver: I teach second grade in Attleboro. What I love best about Lower Camp: Lower Campers may be the smallest but they have some big personalities! It is so much fun to play with them and watch them try new things. They learn so much in such a short time. Campers form new friendships, learn how to swim, gain a sense of independence, and try many new activities. They make me proud every day and I can’t stop smiling whenever I’m at camp. Interesting fact: I have been to the Maldives on the opposite side of the world and I got to kayak, swim, and snorkel in the Indian Ocean. What I love best about Lower Camp: What I love about lower camp is the unique community. 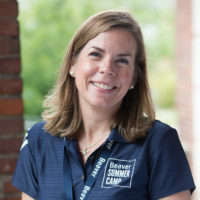 I love working with the youngest campers at Beaver because I get to see them learn about the magic of summer camp for the first time, and I can watch them grow in the camp community. I love returning each year and seeing children I first knew as shy three year olds (or even babies dropping off older siblings) now eagerly and confidently leading other children down the halls as middle or even upper campers. Interesting fact: After college I opened my own online clothing boutique. I currently sew, design, and run the shop from my spare bedroom and when not filling orders I love to create my own clothing such as a new wool coat! What I love best about Middle Camp: Middle Camp is such an exciting time for campers, they have just graduated from lower camp and are ready for a longer day with more activities. Also, Middle Camp is the only group at camp that gets to participate in the Golden Beaver Challenge! It is so exciting to see the middle campers use their creativity and teamwork each week while having so much fun! Interesting fact: I had my first article published in Mathematics Teacher Magazine this year! What I love best about Middle Camp: The Golden Beaver Challenges! The weekly contest is exclusively for middle campers, and it is so funny to see how excited the new middle campers get because it is finally their turn to participate! It is a great way to help the campers foster their teamwork and friendship-making skills as well as show off their Beaver spirit. I love forward to every Friday afternoon to see what each group comes up with! Interesting fact: I am 1 of 34 grandchildren/great grandchildren on my mother’s side of the family – 17 are under the age of 7! And even better – almost all of us live in either Dedham or Norwood. When not at Beaver: I teach kindergarten at the Pierce School in Brookline. What I love best about Upper Camp: My favorite part of upper camp is all of the special events and parties I get to plan for the campers! We take every opportunity we can to celebrate and to have a good time all summer long! Highlights from last summer would definitely include our Liberty Cup, which was part of our 4th of July celebration. 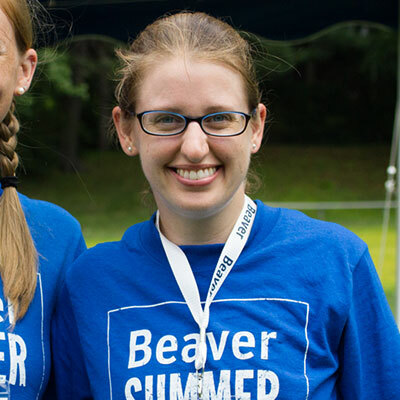 It was jam packed with races, relays, music, and lots of fun, and also our 2nd annual Beaver-Palooza, a music festival that gets more fun each year! Interesting fact: I have an extensive collection of presidential memorabilia. I will also be running my 3rd Boston marathon this spring, if you see me cheer me on! When not at Beaver: I teach Kindergarten at the Underwood School in Newton. What I love best about Upper Camp: The best part of Upper Camp is the campers! They come in with such a wide range of interests and expertise. I learn something new from our campers everyday. It is a joy to see them grow more confident each day as they explore all of the activities and events that Upper Camp has to offer. Interesting fact: I was born 8 pounds and 8 ounces in the year 1988. Also, my sister was born 8 pounds and 6 ounces in 1986! 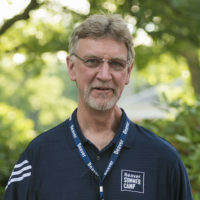 What I love best about Senior Camp: Senior Camp is the perfect blend of tradition and new programming. We’ve developed great field trips and a unique culture with our campers and staff and are always looking for new ways to learn and grow together. I love to see so many of our campers grow into CITs and counselors who are just as dedicated to their campers as we are. When not at Beaver: I am the theater teacher at Westborough High School. I teach acting, tech theater, and film classes, and direct plays for the co-curricular theater company. What I love best about Senior Camp: I think the best part of Senior Camp is that the campers get to choose what they do all day long. It allows campers to gain experience in trying out as many new activities as they can, and lets them discover what they really enjoy doing most. Our staff also gets to participate in the wide range of offerings at camp, and I love seeing them get as excited about activities as all the campers! Our Wednesday excursions are also great! Interesting fact: My favorite number is 13—my birthday is on the 13th and my alma mater, Colgate University, has an obsession with the number 13 dating back to when the college was founded. I think Friday the 13th should always be celebrated, not feared! 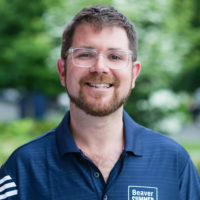 When not at Beaver: I teach science in the upper school at Beaver, so I am at Beaver all year. What I love best about our Aquatics Program: One of my favorite moments at the pool is when a camper passes the deep end test for the first time and is so proud of themselves. Interesting fact: I probably do a better belly flop than anyone I know. 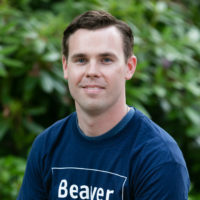 When not at Beaver: I work as a Teaching Assistant for grades six through eight. 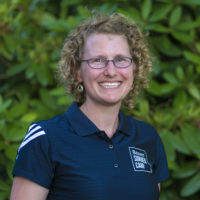 I specialize in working with children with mild to moderate academic disabilities and co-teach strategies to help them accomplish daily school tasks and regain focus. I also help coach track & field and football during their respective seasons. What I love best about our Aquatics Program: I love that we get to spend time with virtually every group from camp. It is amazing to be able to see all of the happy faces and know that they enjoy their time at the pool. It feels even better when I walk away from a lesson feeling proud that a lot of the campers we see will walk away from camp with a life skill that can really come in handy. Plus the amazing projects and games that have been created using the pool are really fun and amazing to see. Interesting fact: I make a mean chicken parm or stuffed pasta shells. 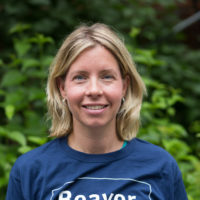 When not at Beaver: I’m a kindergarten paraprofessional at the Pierce School in Brookline. What I love best about our Aquatics Program: I love to see campers’ excitement when they have passed a swim level or the deep end test. 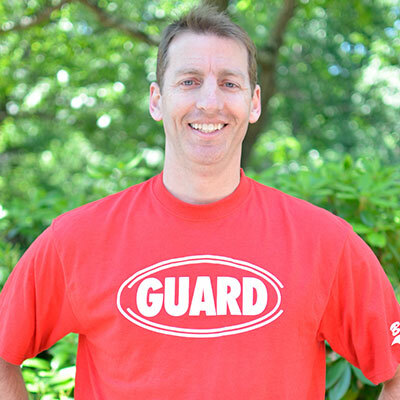 The pool is a great opportunity to work with campers of all ages. It is great to see the progress campers make in their swimming skills throughout the summer and how they become proud and confident swimmers. I love seeing how much fun campers have swimming in the pool from our youngest campers to our oldest campers. Interesting fact: I enjoy traveling, going to the beach in the summer, and skiing in the winter. When not at Beaver: I’m always at Beaver. 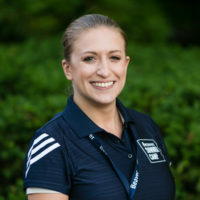 English teacher, coach, and administrator. I like to read, work in my yard, and follow the local teams. 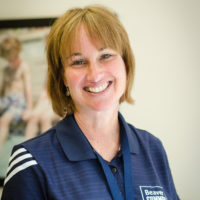 Why we place such importance on safety at Beaver: At Beaver Camp we strive to provide a fun, nurturing, and safe environment for our campers to grow and learn. We take pride in our campus, our facilities, and our programs, and we constantly evaluate what we do and look for ways to improve. Providing a safe camp experience ensures that we give each of our campers the opportunity to have fun each day and grow with confidence. 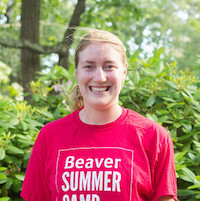 Interesting fact: All four of the Manning children have been counselors at Beaver Camp, but not at the same time. When not at Beaver: I teach English to freshmen and seniors a Newton South High School. What I love best about the Counselor-In-Training program: The CIT July 4th dance is always the highlight of the summer! Interesting fact: Joe Dimaggio signed the cast of my broken arm in a New York restaurant in 1973. 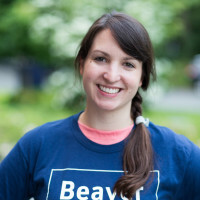 When not at Beaver: Teaching English in Beaver’s incredible middle school or spending time with my husband and two boys, who are two of Beaver’s happiest campers! 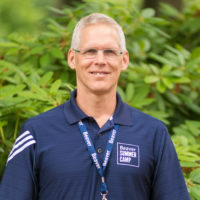 What I love best about the Counselor-In-Training program: Bridging the gap between camper-dom and the awesome world of counseling for outstanding, enthusiastic young teens. Interesting fact: If I see an interesting movie trailer of a newly-released movie that’s based on novel (especially those in the realistic fiction or young adult genres), I can’t wait to get my hands on the book, and I start making plans to see the movie when it comes out. When not at Beaver: I teach 4th/5th Grade Teacher in the Language Learners Program in Lexington Public Schools. 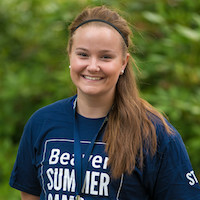 What I love best about our Trip Camps: The best part of camp for me is when campers and counselors are excited about the places/activities they get to visit and do off-campus around New England. Also, the look of victory on campers’ faces when they try a new activity that they never thought they could or would do before (like surfing, skateboarding, camping, hiking, or riding the fastest coaster). Interesting facts: I am a triplet (I’m lucky #3)! I taught in New York & California. I BMX, skateboard, and surf in my free time. And, I have a beautiful wife and an amazing son who just turned one! 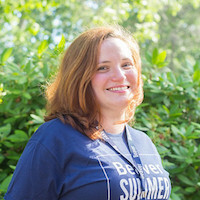 When not at Beaver: I am a fourth grade teacher in Essex, MA. 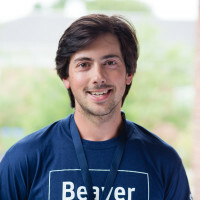 What I love best about Beaver: I love seeing the counselors and specialists having fun right along with the campers whether it’s running and jumping, blowing bubbles and practicing kicks in the pool, or creating a beautiful art project. Our campers get to experience so many different activities that expand their horizons. Interesting fact: Since I have started teaching in Essex, I’ve taught first, second, third, and now fourth grade consecutively. Now I’m finally able to stay in a grade! I’m really enjoying reading all the fourth grade books and learning new things in our science curriculum. 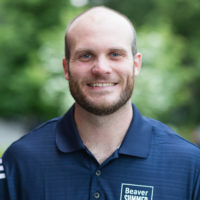 When not at Beaver: I work at an extended day program and coach ski racing. What I love best about our Sports and Adventure/Challenge program: I love being able to challenge campers and see them overcome physical and personal obstacles. It is a great reward to see them grow as individuals and as a community. Interesting fact: I have traveled to Samoa. When not at Beaver: I teach Theatre Arts at Newton South High School. 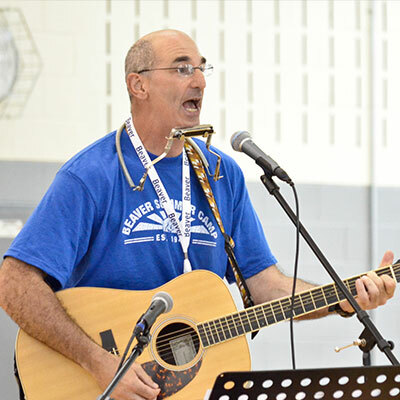 What I love best about Performing Arts at Beaver: Of course I love seeing our campers shine in our various performances throughout the summer, but I also love seeing campers enjoy the arts in the relaxed and fun daily sessions. Interesting fact: I grew up on a farm in Central Nebraska. When not at Beaver: I teach preschool and when I am not doing that I am a busy, happy, sleep deprived mom of 2 great kids. 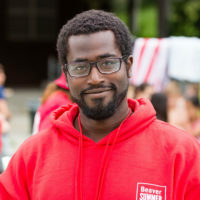 What I love best about Visual Arts at Beaver: The sense of community at Beaver is like no other, and what we are able to accomplish artistically with campers each summer is because of that community. The combination of amazing staff, enthusiastic campers and a can-do attitude make the art space the best place to spend the summer, but of course I am biased. Interesting fact: During my junior year of college I spent 4 months in Kenya. For three weeks, on safari, I studied dung beetles and wrote a 10 page research paper by hand by candlelight.